The Pittsburgh Mercy Parish Nurse & Health Ministry Program has developed an Electronic Documentation System. Created especially for – and with input from – faith community nurses and health ministers. The system is specifically designed for those interested in documenting their health ministry activities and creating outcomes data and reports. We invite you to try our free demo. In order for the demo to work, you must have Microsoft Access 2000 (or later) installed on your device. If you need help accessing the demo (instructions are below), please contact us. Preview the demo on YouTube. Download the demo and save to your device. The demo is fully functional. Demo users can add new contacts and interventions to the fictitious clients in the demo, but cannot add or change clients. Select the options that pertain to your ministry. The opening screen illustrates the scope of data that you can collect. Open the various pages of the chart. Clicking on any box with blue text will open up another form. Explore the various features in the demo, including Reports, Client Problems, and Client Outcomes. Reports can be generated with ease to show the impact of your ministry. To generate a report, go to the opening screen. Click on the Reports button. Select the type of report you want to view. Using a wholistic care approach, you can document Client Problems under the following categories. Select one from the available menu or add your own. Client Outcomes are easily identified and viewable. Details are phrased in lay terms so clergy and health ministers can easily understand. For more information or to order the Pittsburgh Mercy Parish Nurse & Health Ministry Program Electronic Documentation System, contact us or call 412-232-5815. Note: Faith communities and faith-based organizations that have faith community nurses serving in multiple locations may be eligible for an additional discount. For details, please contact us or call 412-232-5815. The Pittsburgh Mercy Parish Nurse & Health Ministry Program is pleased to offer “The Faith Connection,” a free e-newsletter containing news and ideas for your health ministry. Issues are posted here monthly. For more information about “The Faith Connection,” please contact us, or call 412-232-5815. Note: Adobe Reader is required to view PDF files. If you need to install the software on your device, you can obtain it for free from Adobe’s website. The Pittsburgh Mercy Parish Nurse & Health Ministry Program has a health minister lapel pin available for purchase. Use them to help identify health ministry team members in your faith community. Each lapel pin measures 1 1/4″ (vertically). Pins are dark purple, with a gold-colored, finished edge, and a clutch back. The design and shape of the pin is similar to a stained glass window. The pins are finished with a cloisonné process. 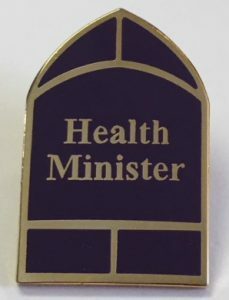 For more information or to order the Pittsburgh Mercy Parish Nurse & Health Ministry Program health minister pins, contact us or call 412-232-5815.